Raleigh, NC, Lulu.com, September 2014, hardcover $35.99 (iii + 264 pages), trade paperback $17.99, Kindle $5.99. The opening of Wild Dog City is deliberately confusing. “It was utterly dark, the cold air sinking in the high concrete tunnel with a dull rushing sound, like the long sigh of an invisible giant. The blackness was really absolute; the platforms and the blandly tiled walls and the trench lined with a metal track were all blanketed in that whispering emptiness. The electric lights that had once lit the subway had long since sputtered out. But there was a sound, under the humming of air; claws softly scratching concrete. The voice was high and strange, the word sharp in the blackness. It came again. The setting is a human city that has long been abandoned to dogs, wolves, foxes, and canids of all sorts. If it isn’t New York, it could be. The empty buildings have become the lairs of intelligent, talking canids, not otherwise anthropomorphized. The protagonist is Mhumi, a large but naïve young dog. “He was not a domestic dog. His coarse coat was patterned brown and black and pale like dappled sunlight. His ears were cupped and round, the expression on his dark face inscrutable, as his skinny tail curled low between his legs. Mhumi’s adoptive brothers and sisters are Sacha, a bush dog; Kutta, a dhole; and Kebero, a Simien wolf, in a two-story apartment. Mhumi is not the oldest, but he is the largest of them; so when their food runs out after their Mother disappears, and nearby fighting between a golden jackal and a domestic dog frightens them, Mhumi poses as a member of the canid police (a pack of painted dogs) to order them away. He learns more than his Mother ever told him. His adoptive family is despised; his Mother did not rescue orphaned pups, she stole them from their parents. Mhumi just wants for himself and his adoptive siblings to survive, and to find their Mother. He gets part of what he wants. In the process, he learns the answers to some but not all questions: What happened to his, Sacha’s, Kutta’s, and Kebero’s foster mother? Why did she kidnap newborn pups of different canid species? Why was the city abandoned to the canids? What happened to the humans who built it? Why are there wild canids from all around the world living there? Where do they get their food? How can all the canids talk with each other? How did the painted dogs, a southern African dog, come to be the canids’ police? Who or what are the hulkers who threaten to kill and eat everyone? “‘Come with me, Mhumi,’ said Kutta, shouldering him out of the bedroom and away from his thoughts. She pawed open the door to the room at the end of the short hallway. It was a bathroom, with a knocked-over toilet revealing a gaping hole in the floor. Mhumi hopped up to the sink, batting at the encrusted-gray knob until a thin stream of water reluctantly came forth. It tasted like alkali as he lapped at it. “Oldtown’s crowded apartments and townhouses soon gave way to larger buildings, squat and flat like the one that had housed the subway station. Some of the dogs spilled through a gap in a chain-link fence surrounding a playground, startling a family of Rüppell’s foxes that had taken refuge underneath the roundabout into furious, sleepy yapping. Mhumhi could see movement within the darkened and shuttered windows of the school beside it. The cover by Aliza Layne shows Mhumi’s foster mother stealing him as an infant. The settings and events gradually grow more exotic, darker, and much bloodier. A spoiler: Mhumi discovers their Mother’s last two puppies, and they’re not dogs. 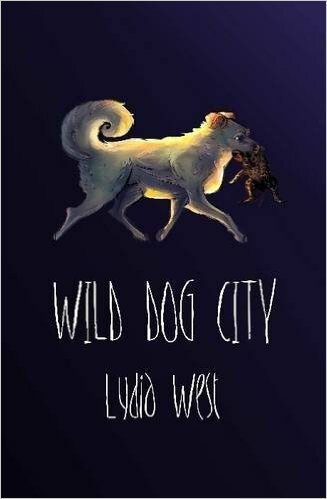 Wild Dog City is fascinating, original, and a real page-turner, but the reader needs a strong stomach to get through it. And it’s no real surprise that it ends with a major cliffhanger, because it’s labeled Darkeye, volume 1. Volume 2, Animal Words, is already published. Volume 3, The Starving Heart, is coming. Lydia West (a pen name) has been serializing this on her Koryos site. It includes photographs of her three pet axolotls.